That is, according to Consumer Reports. You know, the independent, consumer-oriented not-for-profit organization, replete with consumer activists. Recognized as an automotive quality and value authority, Consumer Reports branched out and started reviewing motorcycles last year. 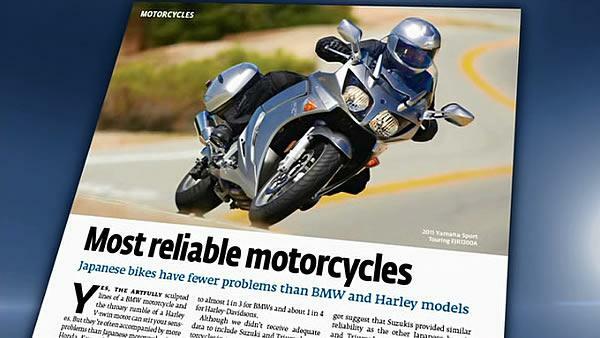 They published the first-ever report on the most reliable motorcycles from five of the biggest brands — Harley, BMW, Honda, Kawasaki, and Yamaha. For some odd reason, Polaris’ Victory and Indian brands didn’t make enough of an impact in the market to attract Consumer Reports attention by the time of the survey. From its research Consumer Reports discovered that quality varies “significantly” among brands — and the best brand, Yamaha, is about six times more reliable than the worst, BMW. Only about one Yamaha motorcycle in 10 has experienced a major problem or required a serious repair over the past four years, according to the 4,424 motorcycle owners surveyed by Consumer Reports. 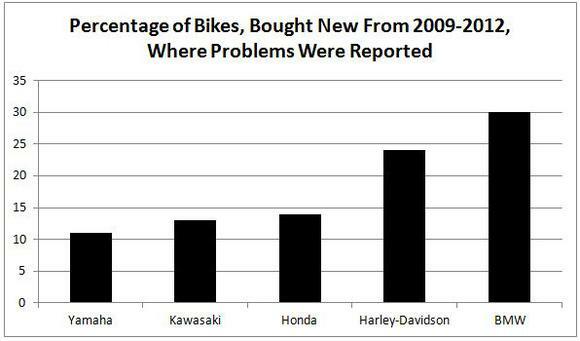 In contrast, about one BMW motorcycle in three has suffered from such a complaint — and one Harley in four. Consumer Reports found that major, big-ticket repairs were few and far between in its research. Regardless of bike and regardless of brand, only about 3% of all problems reported to Consumer Reports involved a motorcycle’s engine, only 3% a transmission, and only 7% a clutch. More common were issues with a vehicle’s brakes or electrical or fuel system, and with the accessories. Overall, Consumer Reports noted that about 75% of the repairs reported to it were performed for $200 or less. Photo courtesy of Consumer Reports.